These guys are amazing at what they do. I won a competition with them last year to be able use their popcorn & candy floss machine for free! i was thinking with not paying anything they wouldn't come and offer the full service that they would normally, which I could understand. I couldn't have been more wrong. The candy floss comes in so many flavours, and they didn't mind us trying the different ones. Simon and Gemma came across so genuine and warm that everyone was enjoying being in their company. They really made the added extra for us on the night. And we've already been pointing people in their direction so they can get booked up with them. Thanks so much again to you both, we hope to see you soon. Brilliant service and an amazing selection of sweets. Great price - highly recommended. Booked for our wedding yesterday Absolutely no words to describe how amazing Gemma and Simon are, I had expectations on how my wedding venue would look but you went above my expectations, the room looks sensational and the ferries wheel was fantastic!! Thank you so so much for everything, definitely be using you again for events. Amazing! 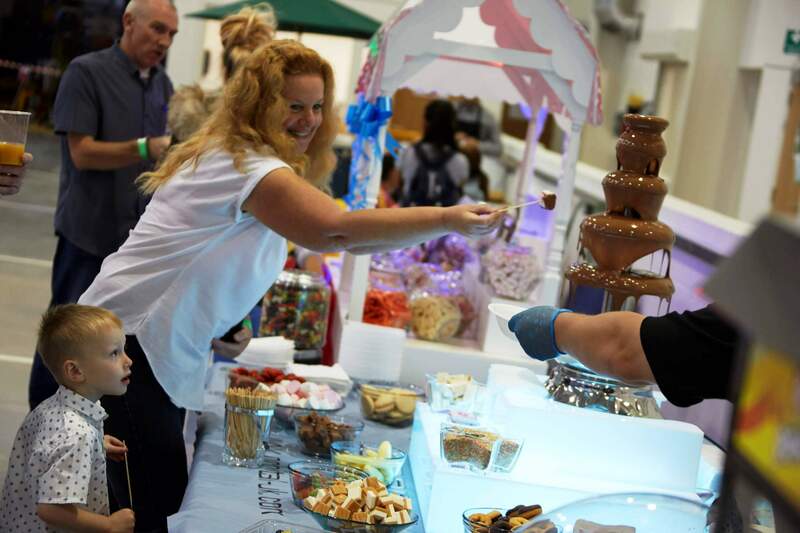 Booked for our site funday after having them for a chocolate fountain at Christmas 2017. Nothing is to much, we had hot dogs, candy floss, popcorn, pick and mix and the outdoor games. We had over 500 people in 2 hours, Simon, Gemma and the boys worked so hard to ensure everybody was served in this short time frameHave already started to discuss Christmas booking with them. Booking with these is a must! Thank you so much for the popcorn and camdy floss at our wedding it went down a treat. Everyone commented on how nice it was. And nothing was too much trouble. Well... what a hit the Ferris wheel sweet cart was for a theme park wedding !! All the children loved it ..... as well as the grown ups !! Fantastic service... and finding my favourite sweeties that weren’t on the original order was a lovely touch. Thanks again. Tim and Rachel Mellors. Brilliant service from this professional business. From yummy sweets to light up letters. Would recommend for your event. Great service and communication received from Sweets Cart from start to finish. We loved the Mr & Mrs Letters and the guests loved the sweet cart and it complimented our wedding perfectly. Would highly recommend! Thank you to Simon and Gemma at sweet carts. Your professionalism and support was fantastic and you really added a beautiful touch to the Santander charity ball. Thank you guys you truly are amazing and I would recommend you to all my friends and family and colleagues. Cheers guys! Thank you for coming to our year 6 prom! The children had a fantastic time and loved the sweets, popcorn and candy floss! The service was amazing ,great cart and love sign, very professional made the day even more special and put a extra sparkle to the room.